Onshore, topographic effects are one of the main driving forces of the wind regime. With no topographic effects offshore, other factors dominate the variation in wind speed with height. The surface roughness (a parameter used to describe the roughness of the surface of the ground, referred to as Zo) is low, which results in a steeper boundary layer profile (also referred to as the wind shear profile), characterised by the symbol α. 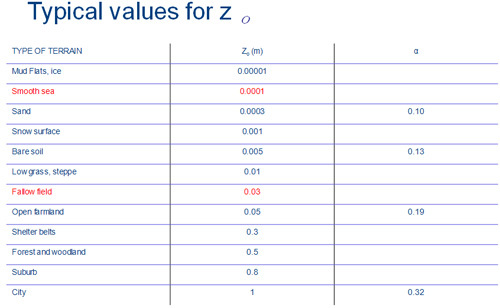 A range of typical values for Zo and a are illustrated in Table 5.1. Offshore, the surface roughness length is dependent on sea state, increasing with the local wave conditions, which are in turn influenced by wind conditions. However, this relationship is complex, as the sea surface, even when rough, does not present fixed roughness elements such as trees, hills and buildings, as tends to be the case onshore. The low surface roughness also results in low turbulence intensity. This serves to reduce mechanical loads. It also may increase the energy capture compared to an identical wind turbine at an onshore location with identical mean wind speed. The coastal zone, where the properties of the boundary layer are changeable, extends away from the shore for varying distances, and this can result in variations in wind speed, boundary layer profiles and turbulence across the wind farm. Stable flow conditions are also evident offshore. In these situations, air streams with different origins and air temperatures can be slow to mix. This can manifest itself as unusual boundary layer profiles, and in some rare situations wind speed may even reduce with height. A further factor influencing offshore winds can be the tide level in areas with a high tidal range. The rise and fall of the sea water level effectively shifts the location of the turbine in the boundary layer. This can have impacts in variation of mean wind speed within a period of approximately 12 hours, and also on the variation in mean winds across the turbine rotor itself. Temperature-driven flows due to the thermal inertia of the sea initiate localised winds around the coastal area. Compared to the land, the sea temperature is more constant over the day. During the day as the land heats up, the warmer air rises and is replaced by cooler air from over the sea. This creates an onshore wind. The reverse effect can happen during the night, resulting in an offshore wind. The strength and direction of the resulting wind is influenced by the existing high level gradient wind, and in some situations the gradient wind can be cancelled out by the sea breeze, leaving an area with no wind. Finally, as all sailors are aware, close to the coast there are ‘backing’ and ‘veering’ effects.